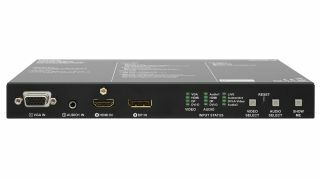 The What: At InfoComm 2017, Lightware debuted its newest multiport switcher, the UMX-HDMI-140, designed for spaces like huddle rooms. The What Else: The UMX-HDMI-140 was designed for digital and analog video and audio signals: VGA, YPrPb, DVI, HDMI 1.4, and DP 1.1 with HDCP and analog stereo audio from local inputs or embedded 7.1 HBR audio. The unit’s Advanced EDID Management can fix and lock EDID data on each input connector. The device has VGA, HDMI, DVI, and DisplayPort input port connectors, forwarding video to the HDMI output. It offers further ports for audio embedding and de-embedding, including a 3.5mm jack connector for audio input. Control options include IR, RS-232, and Ethernet. The Bottom Line: The UMX-HDMI-140 features Event Manager, Lightware’s built-in control solution, which provides the necessary control for smaller collaborative spaces such as huddle rooms.